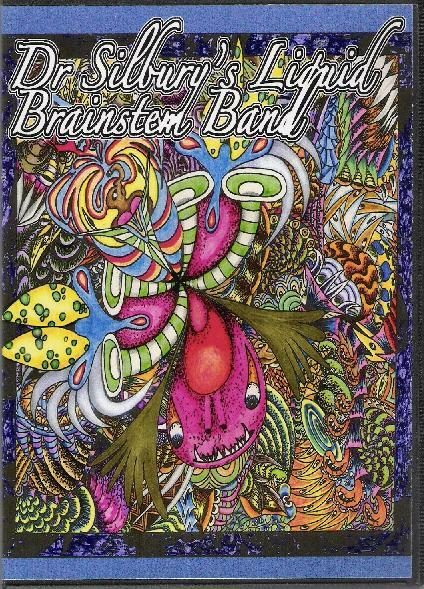 Mooch - "Dr. Silbury's Liquid Brainstem Band"
So we've got 2-CDs covering a variety of music and participants. "Eight Spokes" opens the first CD with a bouncy keyboard melody, space electronics and ripping psych guitar leads. There's also some spacey, more standard sounding, Mooch segments, that transition between the melodic sections, resulting in a very nice 9+ minute introductory track. "Cwmyoy Dub" does have Dub beats but there's much more than that going on. Soaring liquid psych guitar combines with meandering alien electronics and a Dubby rhythmic pulse to create an atmospheric and acidic spaced out psychedelic track that is simultaneously eerie and trippy. There are intermittent vocal bits from John Toon. And I especially dig the section where the acoustic guitar joins in and things get briefly complex and freaky. Excellent track. The 16 minute epic "Jupiter Event" is described on the Dr Silbury web site as a 16-minute Floyd-style epic about Jupiter & Europa, and it is precisely that. I had this album playing in my car for weeks and I would play this song alone over and over and will now officially declare it my numero uno favorite song of 2007. Yes, it's very EARLY Floyd styled, but it's just got a great all around old time late 60s/early 70s spacey psychedelic prog feel to it. And in true progressive fashion it masterfully transitions through multiple themes, from seductively dreamy to heavy psych rocking. Lots of beautiful guitar and keyboard contributions. Then around the 9 minute mark the music fades and we find ourselves alone… with waves crashing against the shore and unseen creatures howling from the shadows. But there's also the sounds of the spacecraft and human transmissions. This goes on for a few minutes until guitar and drums pick up again and then launch back into the main song. Wow, what a fantastic song. At the time I wrote this review "Jupiter Event" was available at the Mooch Myspace site so check it out (link below). The atmospheric "Saz Interval" is next, a very short saz (Turkish 7-stringed lute) and electronics piece that's serves to help us refocus after the lengthy "Jupiter Event" and lead into "Anderson Council", which has a dancey La-La-La whimsical vibe. "The Falcon" is an ambient-melodic chill-out tune with Don Falcone on keyboards and occasional vocals by Karen Anderson. Anyone who ever got to hear the Falcone-Palmer collaboration album "Gothic Ships" will appreciate this track. "Silver Violet Flame" closes the first CD and is another highlight track with vocals by ex-Hawkwind singer Bridget Wishart. Musically this is close to the trademark Mooch sound, though it's made into an actual song that's more than fitting for vocals. Deeeeeeep space drift. Very nice. The second CD begins with two more songs with vocals by Bridget. "Sandman" and "Cycad" are both spacey chill-out tunes, with "Sandman" nicely enhanced by the vocals and dreamy sax solo, and "Cycad" has beautiful psyched out guitar bits that I liked. The 13 minute "Damien's Drums" is another one of my favorites on the album. This is a true space-prog epic that transitions through multiple themes. We've got a killer blend of symphonic keyboards, space electronics and psych guitar soloing, excursions over alien landscapes, high octane space rock, and a stunning contribution from Cyndee Lee Rule's viper violin. And John Weber provides the narration that precedes each thematic shift. "Outback Event" is a meditative floating space electronic piece embellished by didgeridoo from Paul Didge. "Piano Interval" is exactly what the title says… a 2+ minute solo piano piece that more or less serves as an intermission between the first and second half of the CD. "Houri" is described as an "oddity of noise and samples beats" and that pretty much nails what it is. Soundscapes, sound-art, and miscellaneous rhythmic patterns all blended and morphed in a variety of ways, plus spoken poetry by Bridget. "The Gulhane Gardens" is a space-ambient track, augmented by keyboards, horns and guitar. Parts of it have an ethnic feel that gives the music a feel much like some of Steve Palmer's Blue Lily Commission music. The music develops steadily yet subtly throughout its 11 minute length and really swept me away to cosmic dreamland. Gorgeous! The last three tracks comprise the parts of "The Alien Trilogy". "Alien's Song" is a bouncy whimsical song with a catchy melody. "Eat, Eat, Eat" is a soundscape and percussion piece that has an image inducing soundtrack feel to it. And "The Sound of Emptiness" is similar but without the percussion. In summary, this is a wonderful album that will appeal to Space Rock and surely lots of Prog fans. Some people might think there's too much variety on the album but if you take the time to get into the story and read the album notes you'll find that it really all works very well. Be sure and visit the Ambientlive site (link below) because they've done a stellar job with all the information they provide - storyline, detailed credits and track notes, artwork, reviews and Mooch history. And the CDs are housed in a DVD case, which helps enhance the psychedelic artwork by Dale Jarrold. ALSO NOTE that Ambientlive has just released a 2-CD set that reissues "Postvorta" and "Starhenge", two of the long out of print Mooch albums released on the Taste label in the 1990s. For more information you can visit the Ambientlive web site at: http://www.ambientlive.com/albums/drsilbury.htm. Hear Mooch at their Myspace site at: http://www.myspace.com/moochspacey. Visit the Stephen Palmer web site at: http://www.stephenpalmer.co.uk.